JP Morgan Chase Bank Routing Number and other information like phone number, address are given here. If you are searching for JP Morgan Chase Bank Routing Number then you have arrived at correct place. Please scroll down below to see the full list of chase bank routing number of your area. 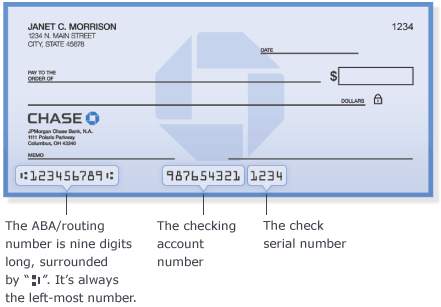 What is JP Morgan Chase Bank Routing Number? JP Morgan chase bank routing number is the nine digit number assigned which help in identifying bank transfers and other transactions. Every Bank branch will have one routing number assigned to it by ABA (american bank association). It helps in identifying the the bank so that bank can send money or receive money from other banks and financial institution. Routing numbers are sometimes referred as Check Routing Numbers, ABA Numbers, american bank association numbers or Routing Transit Numbers (RTN) and many more variants. Routing number can be used for transactions such as banking wire transfer, processing of checks , ordering of checks , direct deposit , automatic bill payments and many such transactions etc. One of the easiest way to find the chase bank routing number given by American Bank Association (ABA) is to look at the bottom of the check of your account. The first nine digit number is your routing number. Chase Account Holder can also login into their online banking account at Chase.com and then going to Customer Center tab and then go to “Set up Direct Deposit” for finding the routing number. You can also call the chase bank customer service phone number 1-800-242-7338 and they will tell you the routing number of your account. Here is the list of Chase Routing number for states. We hope that now you are able to find the correct routing number.